1) TB AUTO-PAUSE TIMING: Another tweak to the timing of combat auto-pause subject to the PCs actions with respect to just having transitioned or coming out of a conversation. 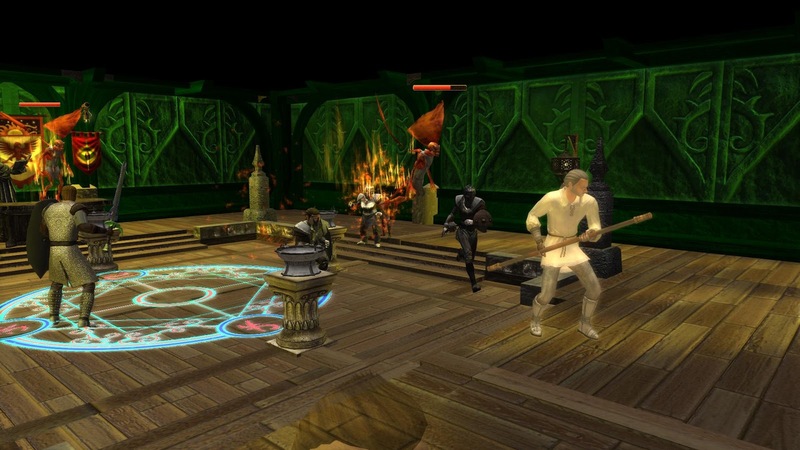 Sometimes the auto-pause could be slightly off and PCs would start to cast spells in these situations, which is supposed to be automatically disabled when allowing auto-pause to pause at the start of combat. These situations are few and far between, but I believe I have caught the remaining few. If we discover more in the future, I will update them then. First, a variable was one out when it came to allowing the heroes to ask about the barrier problem: The option to ask about the barrier is based upon the heroes quest state with respect to locating the rods for Orechin. The option is supposed to be open if the PCs have not yet found all the rods. However, in this case, it had been excluded due to the variable check being out. This has now been fixed. The second issue was the journal entry after the heroes had finished speaking with Melicamp. The main problem was that the code to update the quest state was at the end of the conversation. However, I had forgotten the fact that the conversation would be held twice, and the script that fired at the end would only be valid after the second time of speaking. Therefore, when it ended the first time around, the wrong journal entry was set, causing the illogical flow. This has now been fixed. 4) STORE TEST (MP): I have now added a quick check to ensure that only the party leader actually stores the variables on a STORE TEST, otherwise a second player could clear the variables if they had not written anything, or even change them if they had written anything different to the leader. The Heroes Battle Fire Mephits! The Adventure Continues ... 13. A Tragic Day. Ooze Resistance Oil: Don't Fight Oozes Without It! "Oh no! Betsy!" cried Helden. The rest of the heroes watched in silence as the fighter wiped the remains of the oozes acidic slime from his favourite sword. "Why did I not use the oil! Now, your lustre shineth less so!" The heroes had just defeated two more Grey Oozes from the area behind the barricaded chamber of the sewers. It had been a simple fight, and one that the heroes felt they could handle without any real threat to themselves. In truth, it was, but there had been a casualty of that battle, and "Betsy", Helden's living weapon sword, had now taken acidic damage, causing it to turn into a dead weapon. In truth it was still a good weapon, one of the best (as a dead weapon), but everyone could see that the weapon had lost some of its lustre, and Helden felt it the most. The oozes disposed of, the heroes did manage to locate the final sewer access unit, and after checking its calibration, were now able to start the repair process using the calibration crystals they had recovered earlier. It meant retracing their steps across all areas of the sewers, but Helden had marked the locations of the units on their map and so finding and repairing each unit was a fairly straightforward job apart from the calculations required to determine which crystal was best suited to which unit. By the end of their trek, and repairs, the heroes successfully repaired the status to 91%, so at least they would be rewarded for their troubles, and even managed to earn an extra 100gp for the extra percentage above ninety. The repairs made, the heroes decided to leave the sewers and come back later if need be. For now, they wanted to collect their reward and return Thomsk to its owner, who had already suffered some acidic damage from some ooze acid splash. Thankfully, he did not appear too bothered by the wound, but the heroes decided not to take further risks. 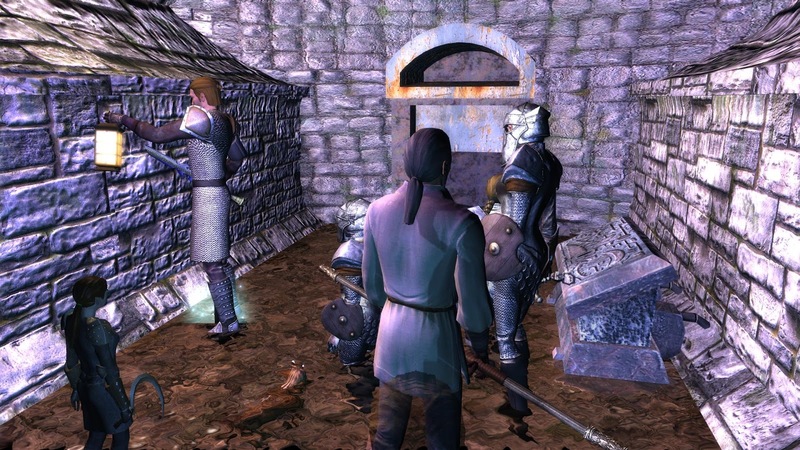 It did not take long for the heroes to exit the sewers via the Guild Hall cellar, and return to the Bloated Buckle, where they found Thomsk's owner. Delighted that her precious cat was returned safe and sound(ish), she gave the heroes a flute for their trouble. It was not until a little later that Karasten pointed out that this flute was magikal and had the power to summon clockroaches! A worthwhile reward indeed! It was now the early hours of the morning and the heroes had been up all night in the sewers, but they determined to visit the Guild Hall (which would have now opened), to collect their reward. 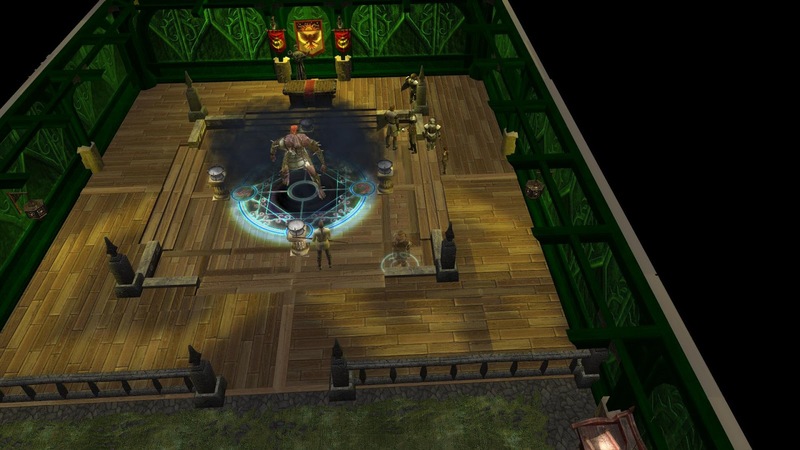 Obi was true to his word, and paid the heroes the 500gp plus 100 gp bonus for completing the sewer task successfully. The sewer reward collected, the heroes finally decided it was time to clean up and get some rest. They had learned a lot over the last couple of days and every one of them had gained in ability through what they had experienced. Threska even claimed that she could now create food and water if the need arose. The heroes slept through most of the following day, and it was already approaching evening by the time they were up and heading towards the Sanctuary. While in the sewers, they had recovered the necklace reported stolen on the Santuary's Mercy Board, and so now wanted to return it for yet another reward. Furthermore, they had need to hear if Orechin had managed to learn anything more about the Fairchild's property. The previous evening, the heroes had noticed sigils glowing above the door frames of the property and so reported their findings to the priest of Boran. He had said to return the following day. Orechin did not disappoint the heroes. First, he was able to reward them in gold for the returned necklace, and then he was able to report his findings regarding the sigils, which had involved Ritualistic magic. The heroes were determined to get to the bottom of this mystery involving the Fairchild's and so Orechin handed them a scroll that would enable the heroes to bypass the magikal sigils that acted as magikal locks to the doors of the property. It did not take long for Karasten to work the magik to break the lock of the sigils, which were now glowing in the early hours of the evening. Shortly after, the heroes had gained entrance to the Fairchild's property. All was silent within, until the heroes heard a terrible otherworldly scream and noticed a strange flying creature turn from the bottom of the stairs ahead. Myara tried to give it a friendly greeting, but it ignored her and the party were soon into combat. Thankfully, Helden and Flint were well equipped and quick to respond. Within a heartbeat, the mephit (for that is what they determined it to be), was dead, and upon it's death, it swirled into inky blackness back to its own plane of existence. What kind of monstrosities had been taking place here to lure such a creature? thought Elana. The heroes continued to make a careful search of the property. In bookcases downstairs they discovered a number of unusual recipes and spell scrolls. But, it was upstairs that the heroes got their first insight as to what may have transpired, after they discovered the dead body of Nancy Fairchild in a pool of blood! Near to her body, they found an unfinished diary she had been keeping, that mentioned the events that had led to her contacting Orechin. The same writings also mentioned a secret chamber beneath the house. The heroes needed no more of a lead and headed straight back downstairs, unrolled the carpet and found a trapdoor that led to the hidden chamber below. Within the hidden chamber, the heroes beheld a terrible sight: The scribblings and markings of Ritualistic Magik! Ralph, Nancy's husband, had been involved in some sort of ritual that he believed could rid the village of the barrier, but it had involved summoning a demon! There were details of everything needed to complete the ritual, but was something that Ralph never completed, because his lifeless stone statue form was at the back of the room, a tragic and unfortunate accident all because of his wife's fears and concerns, that ultimately had also brought about her own tragic demise. "I don't like this." said Helden. "I think we should leave, and leave now!" That would have been the end of the matter if Threska had not piped up by saying, "But the barrier? Don't we owe it to the village and ourselves to try to complete what this Ralph had started, and try to rid the village of this problem?" There were a few seconds of doubt and concern, but the clerics and wizard both agreed that the ritual markings looked as though they would contain the demon and prevent any harm coming to them. "I hope you are right, and that this is worth it." said the fighter, who went on to instruct Karasten to place the ritualistic items they had found into the ritual bowls that would summon the demon. "Something's wrong!" said Myara. The wizard had placed all the components into the correct bowls, but nothing had happened. Myara read over the ritual instructions again, and this time noticed that the order of placement was critical too. Karasten swiftly collected the components and set about replacing them in the correct order. As soon as the last item was placed into the bowl this time, Melicamp, Ralph's demon was summoned within the circle. What occurred next was tragedy upon an already tragic scene. At first the heroes appeared to be managing the conversation well, but after realising that the demon was not going to be able to help them with the barrier, they, instead, asked what else may they be entitled to. The demon responded and offered wealth, power or knowledge, but at a price! That price was to complete another ritual that would enable it to increase in power within its own realm. It was at this point the heroes made a tragic error and agreed to its terms, thinking of their own benefits of an increase in power deafening them to the words that the demon would benefit too! This was a heinous and evil act: to agree to a demon's terms that would increase the demon's own power or standing! Even the knowledge of having to part with Myara's magikally enhanced sickle and some life essences did not sway the heroes decision to see this through. A few moments later, the deal was done, and the heroes were left with a dark fluid potion that supposedly increased intelligence, which was the demon's side of the deal. The deal done, the demon turned to the heroes with a menacing look and appeared to sniff the air around them. It obviously smelt something that it did not like, and gave the impression that if it had smelt otherwise, then they may have been attacked by it. However, something still gave it a moment hesitation, and as it left the scene, it laughed menacingly again, declaring there would be others to taste the flesh of them this time .... and as quick as it disappeared, two larger fire mephits took its place, and immediately attacked the heroes. Thankfully, although depleted of weapons as part of the demon's deal, the heroes had not left themselves short, and as fierce as the mephits were, even their fiery breaths could not overcome the heroes own fierce resistances. Not before long, the two summoned creatures were destroyed and sent back to their own planes of existence. 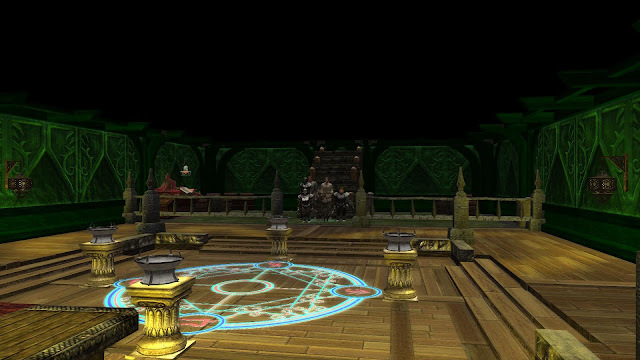 The battle over, the heroes looked at each other, gathered themselves, and left the chamber in silence, to head back to the Sanctuary and report their findings to Orechin. Orechin was saddened by the news, and all agreed that it had been a tragic end to a tragic day; the gold reward for completing the task, a bittersweet moment. TOTAL SESSION TIME (UNPAUSED): 3 Hours 34 Minutes. GAME TIME SINCE START: 20 Hours 48 Minutes.